Gudsen MOZA, the world-leading brand in gimbal stabilizers, proudly introduces the new MOZA Mini-S, a 3-axis smartphone gimbal created for everyone. Designed to be flexible, compact and user-friendly but packed with features included in the Mini-series gimbal line up, the MOZA Mini-S simplifies your filming experience with less time spent on setup and more time for your creative production while on the go. Foldable for easy carrying and storage, the MOZA Mini-S' simplified design with no tool adjustment, one-button zoom, focus control, and quick playback simplifies your filming experience with less time on setup and more freedom on the go. 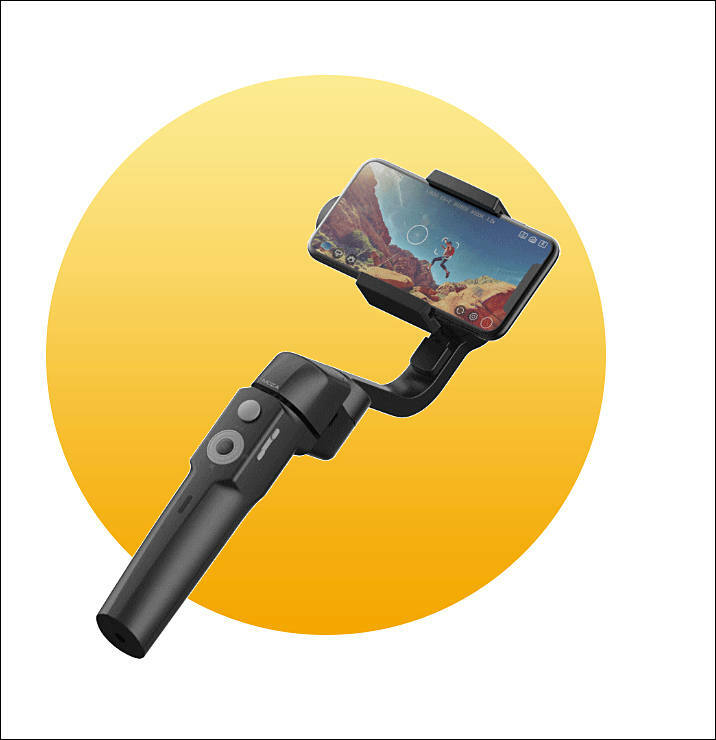 The compact hand-held MOZA Mini-S is quickly turned into a fully stabilized selfie stick, yet the extremely foldable design allows for easy hassle free transportation. The MOZA Mini-S can be extended to 18 inches, giving you a perfect vantage point to capture those precious moments, e.g., selfie, live stream, party and travel. The MOZA Mini-S gets to the heart of usability and simplicity while maintaining its goal for a user-friendly and versatile experience. The fully established and recognized smooth, stable and reliable traits expected from MOZA series gimbals continues with the MOZA Mini-S. Compared with the previous Mini-MI, the Mini-S is easier and quicker to set up and balance. Along with an ergonomic design, you can enjoy the convenience of a hassle-free set-up and indulge more time on your filming. Additional features like short-cut buttons and quick replay, simplify the operation while useful functions such as vertical photography and camera control allow you to diversify your mobile filming style and adapt to different scenarios. 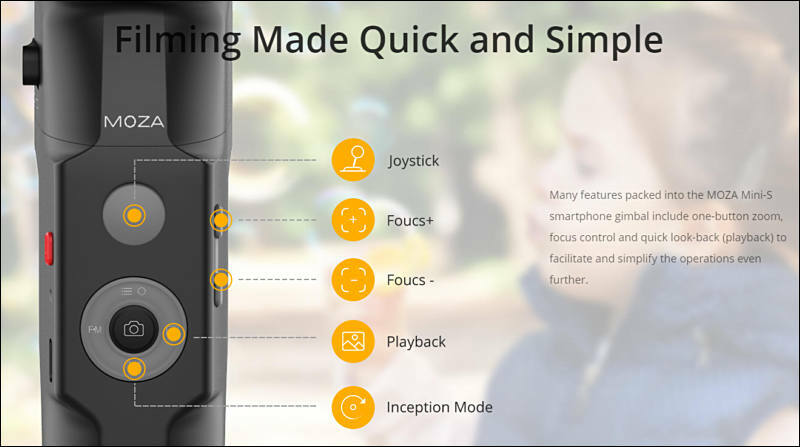 The MOZA Mini-S also boasts various cool shooting modes, including hyper-lapse mode, slow-motion mode, inception mode, sport gear mode and vertigo mode etc. These additional modes help compliment the tools and ability to capture steady, smooth and cinematic footage while enhancing your own style with unique effects. A stunning 3-axis-based gimbal with multiple following modes makes sure each and every motion or object, fast or slow, will be tracked, captured and recorded. The MOZA Mini-S also works in tandem with the MOZA Genie APP to generate better and more convenient film-making compositions with just a tap of your finger to achieve complex effects. Imitating the Leaning Tower of Pisa, the unique 10-degree lopsided contour lends an artistic and ergonomic touch to the shape of the MOZA Mini-S. This smart and compact outline offers a comfortable handholding experience and eliminates worry of your grip slipping. In addition to the black color option, white has been added to the lineup offering a fresher and cooler alternative to match your individualistic style. Welcome the MOZA Mini-S gimbal to the growing MOZA family, and feel its warm and friendly embrace to empower your creativity this winter!